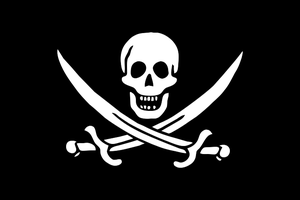 So I’ve finished the first draft of the yet-to-be-titled novel about pirates in space. As difficult as the writing itself can be, editing is its own little beast. It is the shellacking together of various materials; the severing of arteries; the repackaging; the re-pasting; the smoothing over of cracks; the varnishing; the thick coats of paint over the primer. It is the endless decisions: cut this; add that; “over” or “under” or “for” or “to” or “on” or “above”; this name that name his name her name. It is riding the wave of the narrative as it rises and falls and ultimately breaks against the shore. It is pinpointing the details… as a television detective strings together locations on a map on the wall in order to find the crux of it all. It is seeing the forest through the trees; it is watching the forest grow and then trying to camp out inside it; it is trying to find your way through a tangled maze you built yourself. I'd edit my manuscript with a cutlass if I could.